Pivot – Firing the Plan Not the People. 2 Minutes to See Why. buy out an entire company for its revenue and profits. Corporate business development and strategic partner executives are flocking to Silicon Valley to find these five types of innovation. In response, venture capital firms like Sequoia and Andreessen/Horowitz are hiring new partners just to work with their portfolio companies and match them to corporations. They are actively organizing annual and quarterly activities to bring the portfolio and Fortune 500 decision makers together– in both large events and one-on-one visits. The goal is to get a corporate investment or an outright acquisition of the startup. VCs like acquisitions as much as IPOs because the acquiring companies often can rationalize paying large multiples over the current valuation of the startup. For acquirers this math makes sense since they can factor in the potential impact the startup has when combined with their existing business. However, these nosebleed valuations make it even more important in getting the acquired company integrated correctly. The common mistake acquirers make is treating all acquisitions the same. 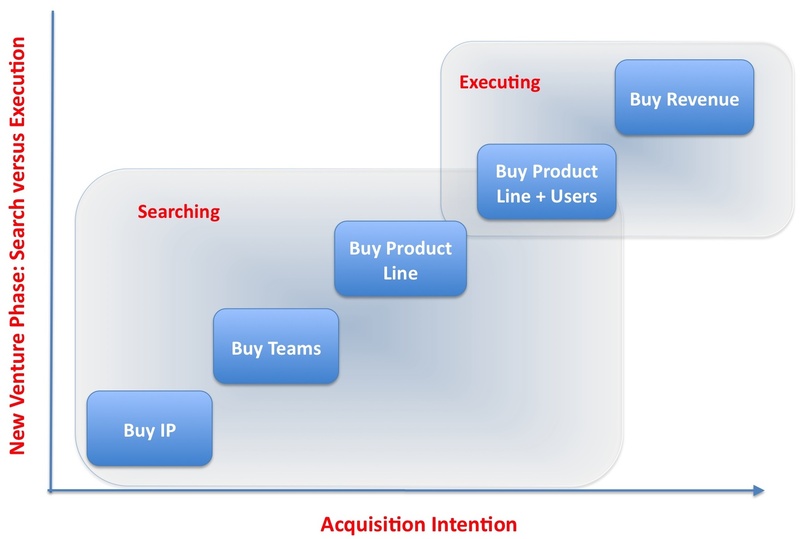 Is the Potential Acquisition Searching or Executing? 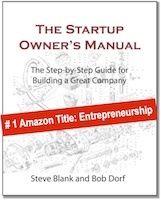 Startups are those companies that are still in the process of searching for a business model. Ventures that are further along and now executing their business model are no longer startups, they are now early-stage companies. Large corporations come to the valley to looking to acquire both startups which are searching for a business model and early-stage companies which are executing. Companies that acquire startups for their intellectual property, teams or product lines are acquiring startups that are still searching for a business model. If they acquire later stage companies who already have users/customers and/or a predictable revenue stream, they are acquiring companies which are executing. What gets lost when a large company looks at the rationale for an acquisition (IP, team, product, users) is that startups are run by founders searching for a business model. The founding team is testing for the right combination of product, market, revenue, costs, etc. 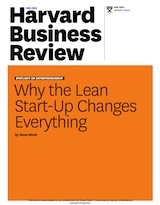 They do it with a continual customer discovery process, iterating, pivoting and building incremental MVP’s. This phase of a new venture is chaotic and unpredictable with very few processes, procedures or formal hierarchy. At this stage the paramount goal of the startup management team is to find product/market fit and a business model that can scale before they run out of cash. This search phase is driven by the startup culture which encourages individual initiative and autonomy, and creates a shared esprit de corps that results in the passionate and relentless pursuit of opportunity. This is the antithesis of the process, procedures and rules that make up large companies. In contrast, early stage companies that have found product/market fit are now in execution mode, scaling their organization and customer base. While they still may share the same passion as a startup, the goal is now scale. Since scale and execution require repeatable processes and procedures, these companies have begun to replace their chaotic early days with org charts, HR manuals, revenue plans, budgets, key performance indicators and other tools that allow measurement and control of a growing business. And as part of their transition to predictable processes, their founders may or may not still be at the helm. Often they have brought in an operating executive as the new CEO. So what? Who cares whether a potential acquisition is searching or executing? 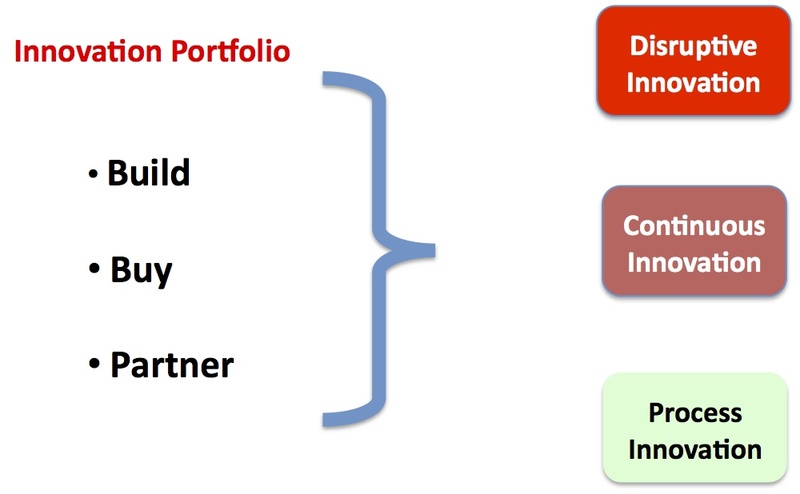 Ironically, the business development and strategic partner executives who find the startup and negotiate the deal are not the executives who manage the integration or the acquisition. Usually it’s up to the CTO or the operating executive who wanted the innovative technology (and at times with a formal HR integration process) to decide the fate of the startup inside the acquiring company. It turns out the success of the acquisition depends on whether the acquiring company intends to keep the new venture as a standalone division or integrate and assimilate it into the corporation. Actually there is a simple heuristic to guide this decision. If the startup is being acquired for its intellectual property and/or team, the right strategy is to integrate and assimilate it quickly. The rest is just overhead surrounding what is the core value to the acquiring company. However, if the startup is still in search mode, and you want the product line and users to grow at its current pace or faster, keep the startup as an independent division and appoint the existing CEO as the division head. Given startups in this stage are chaotic, and the speed of innovation depends on preserving a culture that is driven by autonomy and initiative, insulate the acquisition as much as possible from the corporate overhead. Unless you want to stop innovation in your new acquisition dead in its tracks, do not pile on the corporate KPI’s, processes and procedures. Provide the existing CEO with a politically savvy “corporate concierge” to access the acquiring company’s resources to further accelerate growth. (It helps if the acquirer has incentives for its existing employees that tie the new acquisition’s success to those that help them.) 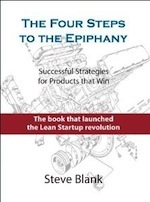 The key insight here is that for a startup still searching for a business model, corporate processes and policies will kill innovation and drive the employees responsible for innovation out of the acquired company before the startup’s optimal value can be realized. 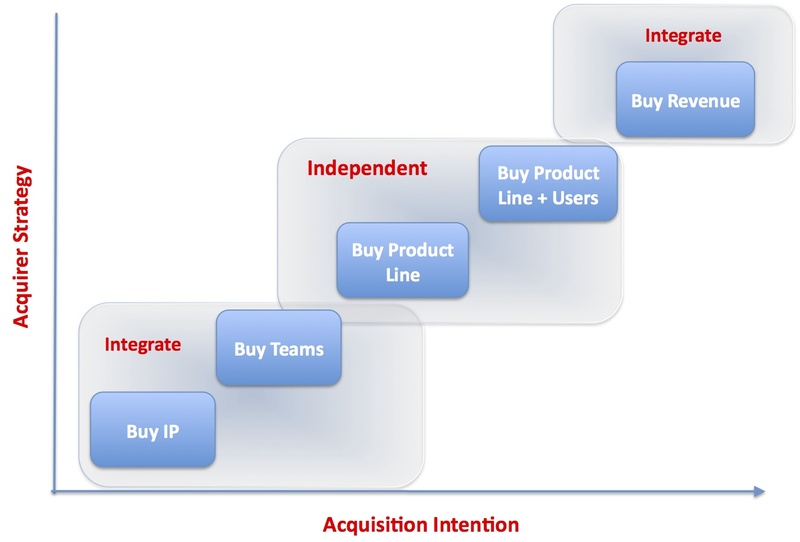 If the acquisition is in execution mode, the right model is to integrate and assimilate it. Combine its emerging corporate KPI’s, process and procedures with those of the acquiring company. Unless it’s the rare founder who secretly loves processes and procedures, transition the existing CEO to a corporate innovation group or an exit.